In case you couldn’t tell, I am a huge sports fan, and this just happens to be my absolute favorite sporting event. My two favorite teams, Memphis and LSU, were mediocre and downright awful this year, but you know what? I don’t care. I will STILL be watching. I always do, because March Madness ALWAYS delivers. The drama and upsets of the first two days of this tournament truly make it unique among major sporting events. 52 games in 2 days, and it’s all here in one app. 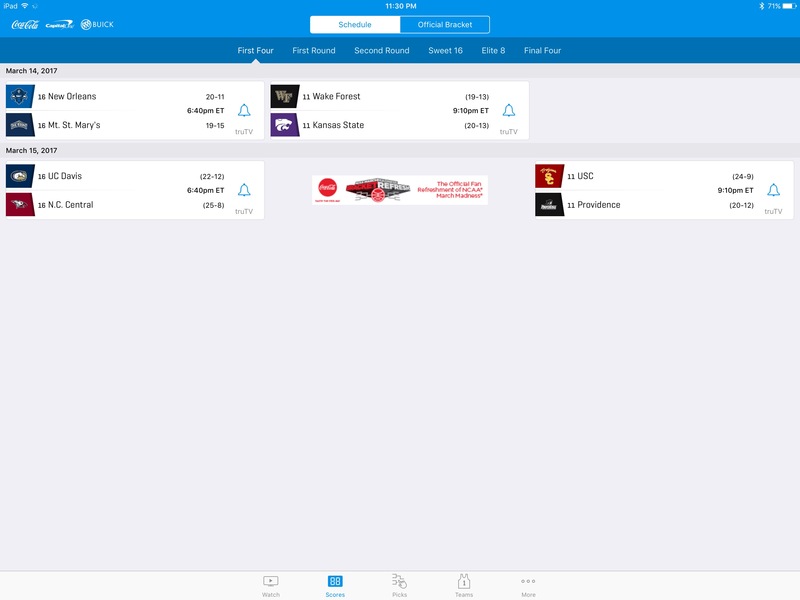 The NCAA’s official March Madness Live app has been around for many years now in various forms, serving up live tournament action, stats, and brackets all across iOS. I have to admit that I’ve had a love/hate relationship with this app over time. There have been years where it was lights out, and others where the developers seemingly randomly removed features, such as the ability to listen to radio feeds rather than streaming video for use in the are and on the go. I LOVE this feature because it allows me to keep up with the action while at work and on the go when video isn’t a good option. This can also save you a lot of data usage, depending on what kind of data plan you are using. So, the developers have really rubbed me the wrong way a couple of years when they inexplicably decided to take it away. This year’s March Madness Live has the radio feeds, and also has apps for iMessage, Apple Watch, and Apple TV. You are literally covered across the board…if you have a cable or satellite plan. The NCAA makes the majority of its revenue on this one event, so there is no way there are going to give way to cord-cutters until they can be sure to replace all of their existing income. Until that day, don’t expect any free basketball except on CBS. March Madness is a free app on all platforms, and will help you get closer to all the tournament action. It is a life-saver if you can’t get to a TV when your favorite team is taking the court, and also makes for a perfect second screen experience, allowing you to watch all of the other games while you keep the one important to you going on your TV. And if you have an Apple TV, you can even use the app to watch there, if you choose. The app also doubles as an effective tourney bracket manager if you want to play on cbssports.com. All around, this year’s version of March Madness Live is looking good so far. Get it now and gear up for the best week in American sports. NCAA March Madness Live is available on the App Store for free, and works across all currently supported iOS devices.